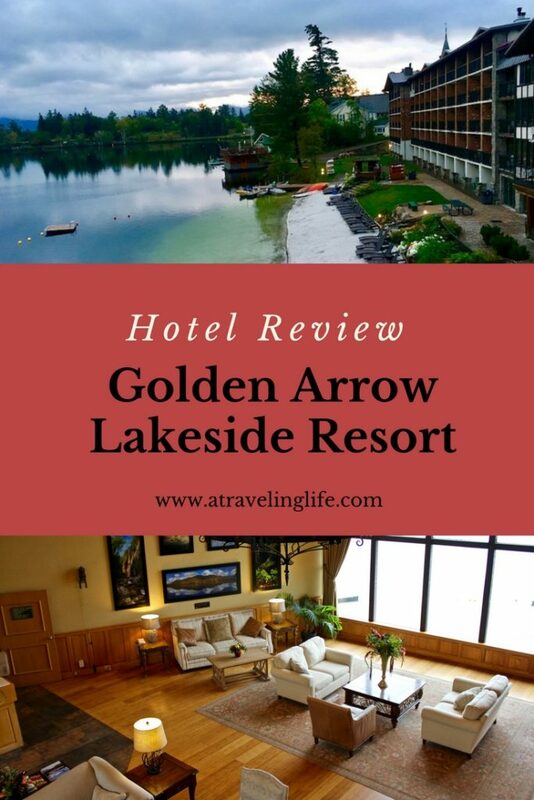 Here is my Golden Arrow Lakeside Resort review. 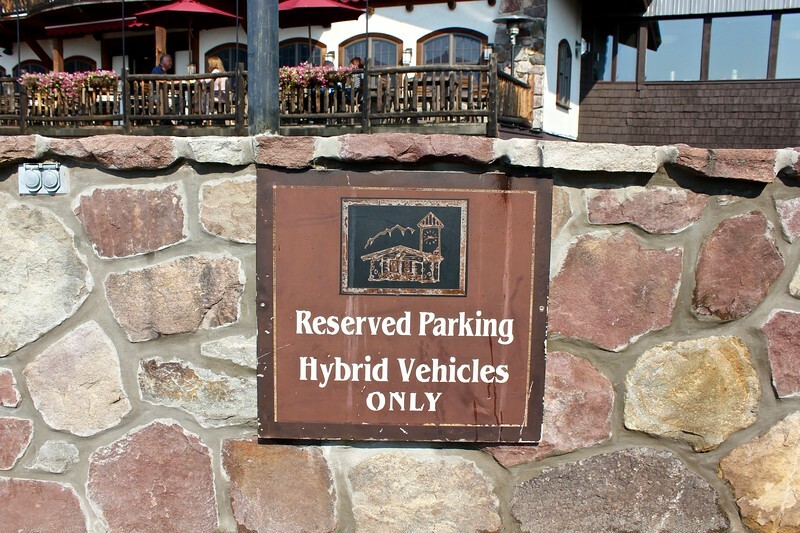 I stayed at the Lake Placid, New York, eco-lodge in early September. 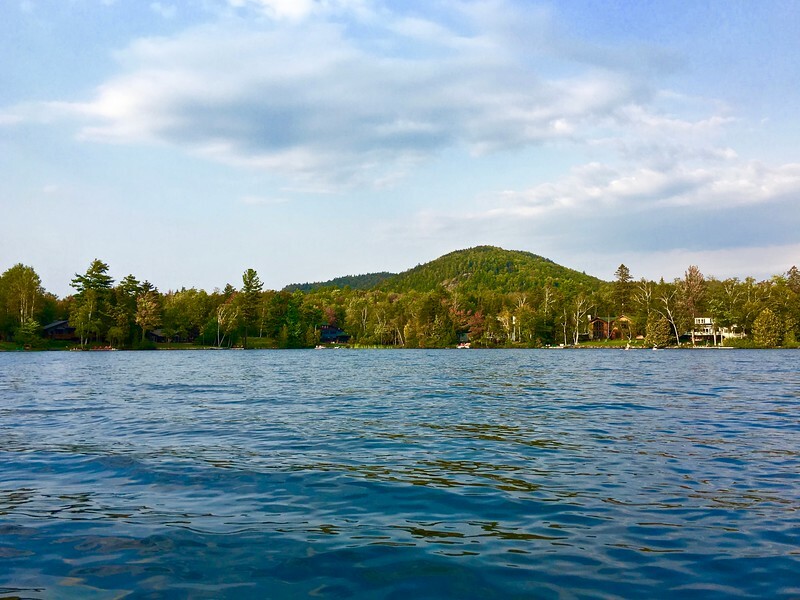 The Golden Arrow Lakeside Resort in Lake Placid is surrounded by six million acres of mountains, lakes, forests, and fields, and is working hard to leave a light footprint not only on the Adirondacks but also on the rest of the planet. During my two-night stay at the Golden Arrow in September, I was pleased to discover that its commitment to preserving the natural environment is the most serious I’ve encountered at any hotel in all of my travels. Luckily I had one sunny day during my visit! 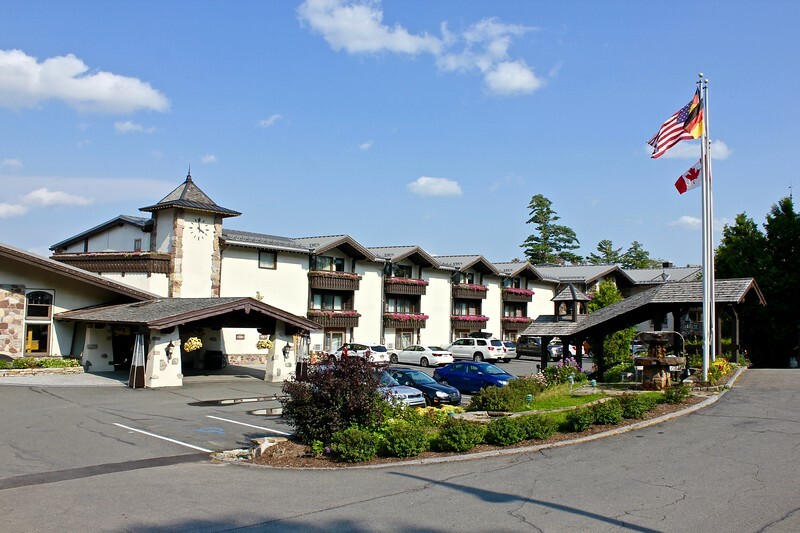 The outside of the Golden Arrow Lakeside Resort reflects the German heritage of the Holderieds, the family that has owned the property since 1974. Driving into Lake Placid on the first afternoon of my stay, I wasn’t able to see much of the area’s natural beauty due to the heavy rain and fog that followed me all the way from New Hampshire. 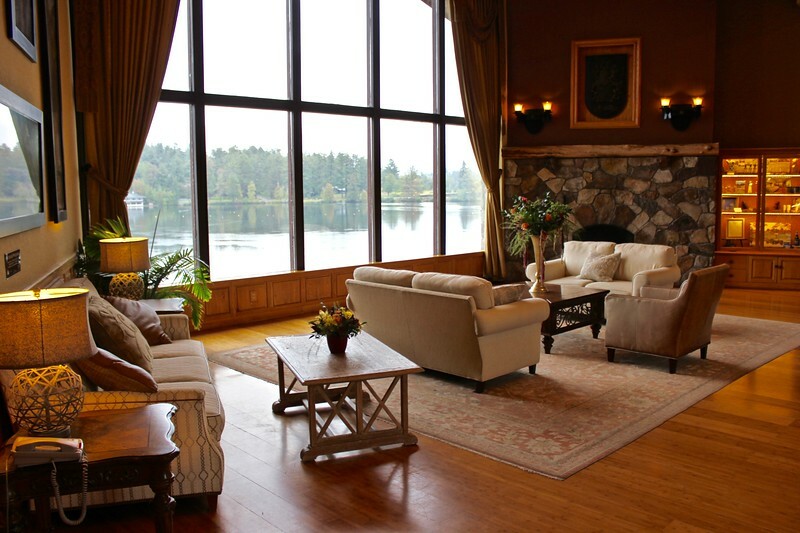 Dashing into the lobby of the Golden Arrow – I forgot my umbrella – I was greeted by a soaring ceiling, large stone fireplace and wood paneling that made me feel like I discovered a cozy log cabin in the woods. The Golden Arrow’s warm and inviting lobby. The resort’s slogan is, “The only thing we overlook is the like!” and here you can see why. 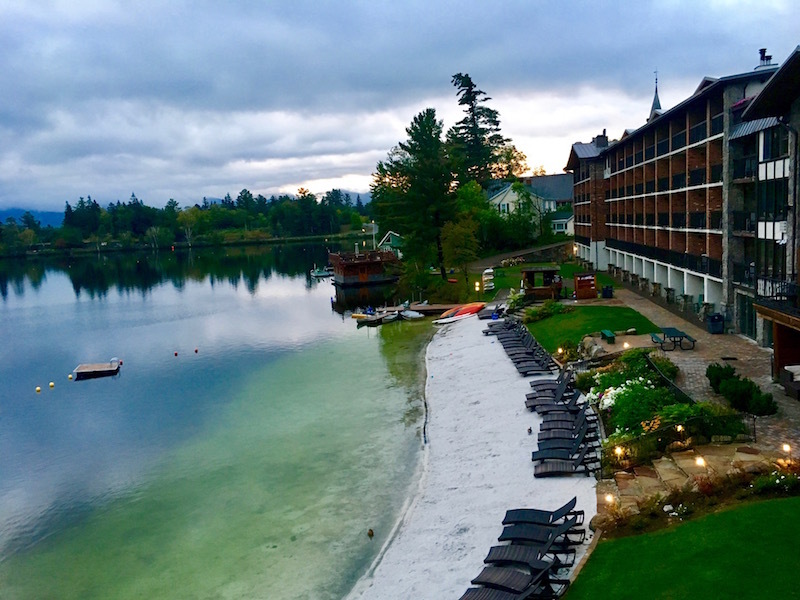 One wall of the lobby is entirely made of glass, offering unobstructed views of Mirror Lake and the surrounding trees and hills – on a clear day, that is – and stunning photographs of the Adirondacks hang on another. The Golden Arrow’s decor reflects the colors found in the surrounding landscape, with green carpet and earth-tone fabrics used throughout. 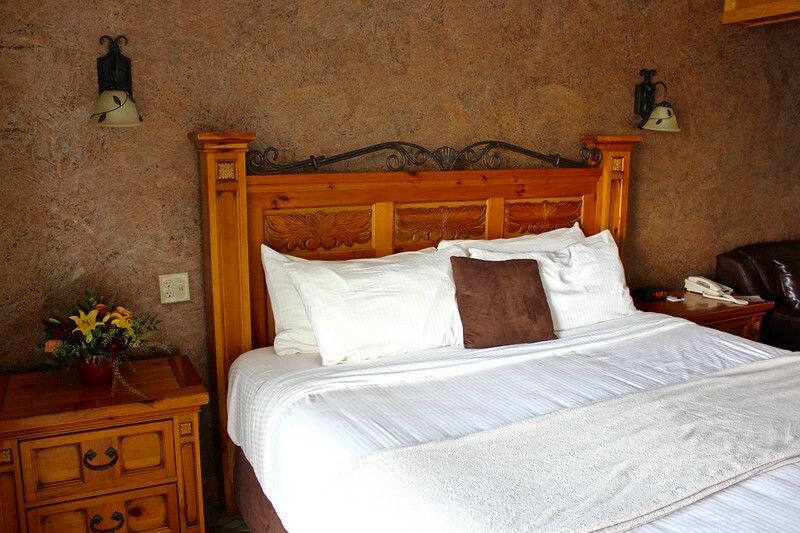 You can chose from a Deluxe Room that faces the Lake or the Village. My Lakeside Deluxe Room was quite spacious, with both a king-sized bed and a pull-out leather couch, and had an earthy feel with heavy, natural wood furniture. 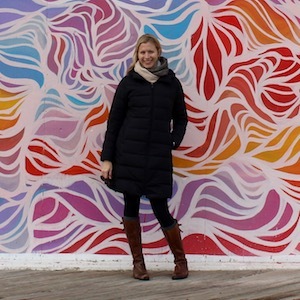 Once settled, I was particularly excited to find a paper bag on the dresser encouraging guests to recycle – I was told 85 percent of guests comply with this request. Given the weather, I didn’t venture far that first night, only to check out the Olympic Museum across the street. For dinner, I decided to head back to and eat at Generations, the Golden Arrow’s on-site restaurant, which features many locally sourced and organic products. 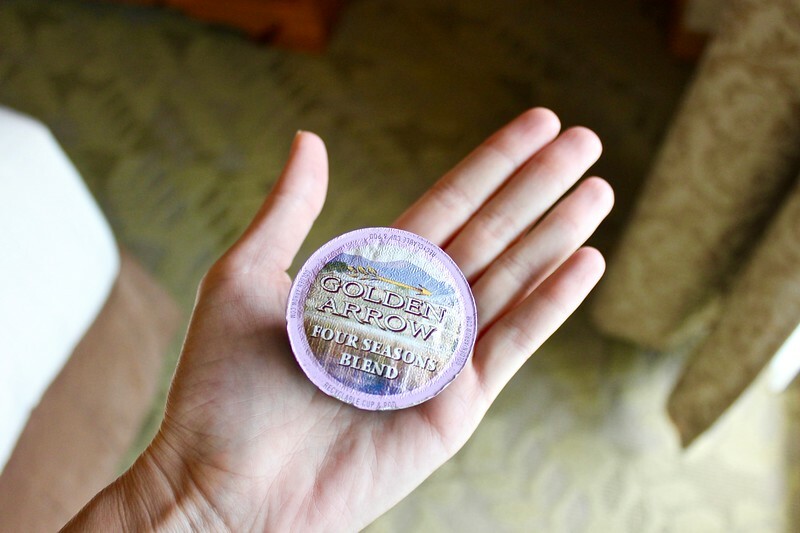 I usually steer clear of Keurigs because of the waste they produce, but this type of K-Cup is made with recyclable materials and can be thrown right in the recycling. After a full day of sightseeing in Lake Placid, which included taking a bobsled ride at the Olympic Sports Complex and looking out from the top of the 26-story ski jump at the Olympic Jumping Complex, I returned to the Golden Arrow to explore the property a little more. Given that the sun was still shining, I wanted to spend some time on the lake, so I headed down to the Golden’s Arrow’s private beach. It’s not just any beach, though – it’s made from crushed limestone, which helps counteract the effects of acid rain. 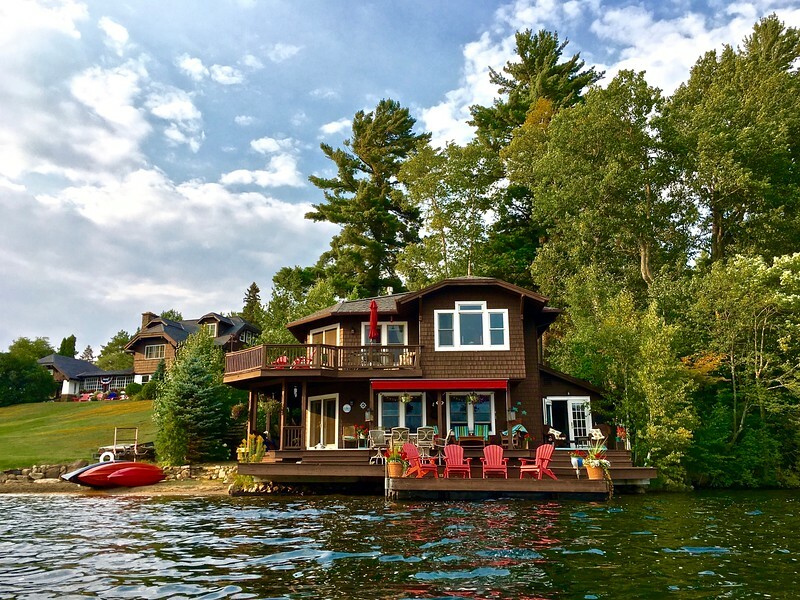 This is pretty much my dream house (taken while kayaking around Mirror Lake). The Golden Arrow provides guests with complimentary kayaks, canoes, paddle boats, and stand-up paddle boards, so I took a kayak out for a spin. The hour or so I spent paddling around was definitely one of the highlights of my trip – motors aren’t allowed on the lake, so it was an incredibly peaceful experience. This quiet spot near the beach is popular for wedding photos. When I awoke on the last day of my visit, I was disappointed to see that the rain, fog and chilly temperatures had returned. So instead of getting in a hike on nearby Whiteface Mountain, I visited John Brown’s Farm and did some work at the Golden Arrow before making the six-hour drive back to Boston. Despite Golden Arrow’s impressive commitment to Mother Nature, she failed to cooperate during my visit, granting me only one day of sunshine. Regardless, I’m certain that the Golden Arrow and Lake Placid will keep me coming back again and again. 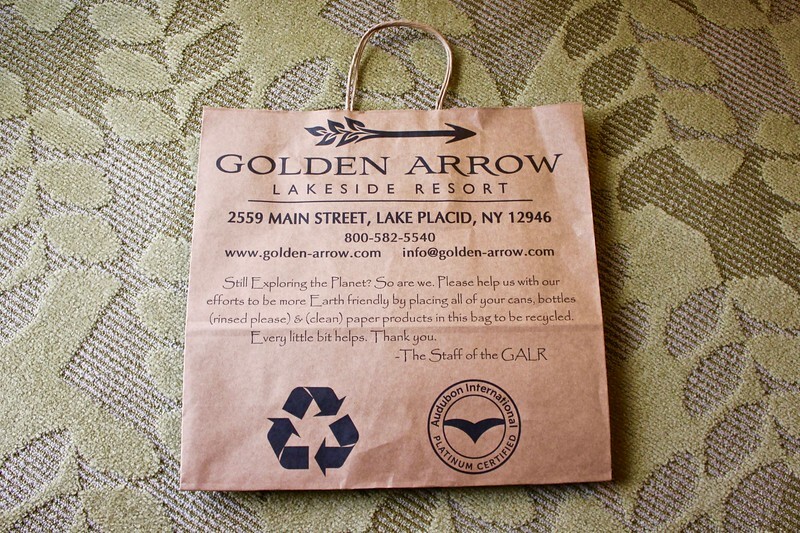 Any guest that travels to the Golden Arrow by foot, ski or hybrid car is rewarded with a “Thanks for being green!” gift bag upon arrival. The Golden Arrow has a 3,000-square foot green roof, which was installed in 2008. It acts as an insulator as well as a storm management system. You can see it from the deck of Generations. All paper products are made of 100 percent recycled content. All bulbs are CFLs (and bought from local Boy Scouts). Green cleaning products are used when possible. However, management admits they’re always on the hunt for more effective products. Laundry is washed in cold water when possible, and detergents don’t contain phosphorus. Bromine is used in the pool instead of chlorine because it’s less harsh. Energy from solar thermal panels is used to heat the pool. Grease from Generations is collected and donated to a nearby farm. I’ve been known to take recyclables home with me from a hotel instead of throwing them in the trash, so I was thrilled to see this bag in my room. I had planned to bring my dog, Lucy, with me, since the Golden Arrow allows dogs to stay in its 3rd floor Deluxe Rooms. However, I was worried she would be uncomfortable during the long drive from Boston, and I didn’t want her cooped up during the rain. The staff was nice enough to give me dog bones for her at check in, which she enjoyed when I got home. Thank you to the Golden Arrow Lakeside Resort for hosting me and for being so helpful throughout my stay. All opinions are my own. 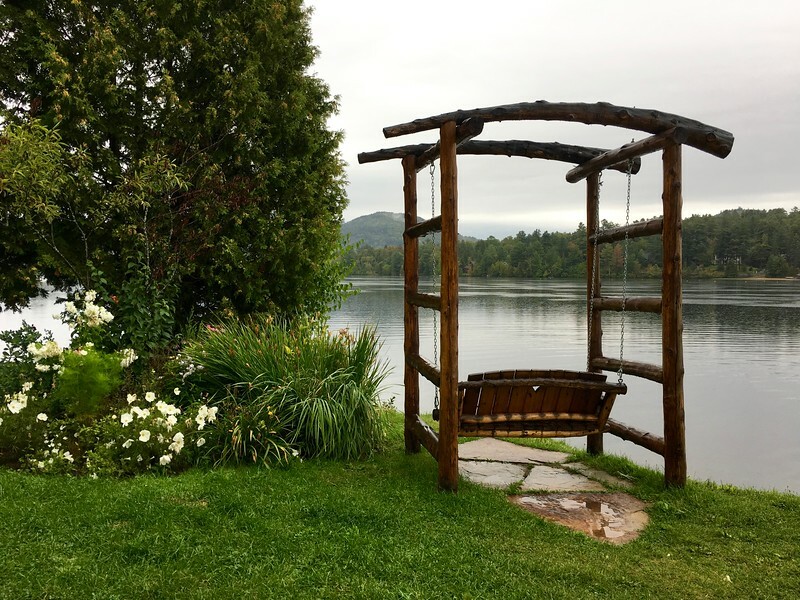 Tags: Adirondacks, Lake Placid, New York, U.S.